As a highlight of the sold-out evening, The Julia Child Foundation for Gastronomy and the Culinary Arts will present the fourth annual Julia Child Award to Mary Sue Milliken and Susan Feniger, chefs, restaurateurs and co-owners of Border Grill restaurants, catering and food trucks. The award recognizes those who have made a significant difference in the way America cooks, eats and drinks. Special guests include Chef Bobby Flay as master of ceremonies, food editor and writer Barbara Fairchild and Chef Traci Des Jardins as featured speakers and Chef Kajsa Alger as award presenter. Milliken and Feniger, the first women to receive the award, donated a number of objects, papers and photographs representing their more than 35-year careers and business partnership. The collection includes the 25-piece knife bag used by Milliken when she competed on Top Chef Masters in 2011, select dishes from City Café that the duo opened in the 1980s, two chef’s coats, one blue and one pink, as well as menus, artwork commissioned for the restaurants and notebooks with their comments on food and ingredients from their trips to Mexico and India. During the Smithsonian Food History Weekend, the museum will host a temporary display of selections from the donation. Inspired by Milliken and Feniger’s culinary journey and their years of traveling and cooking around the globe, the menu for the gala will feature French-inspired dishes as a nod to Julia Child, as well as plant-based bites, in line with the chefs’ long-standing dedication to serving sustainable ingredients. Appetizers include feta-stuffed roasted red peppers and tomato fennel soup shots with Pernod cream, served with fresh squeezed Border Grill Margaritas and Mojitos. The first course will feature a duo of Border Grill’s CITY salads, including Thai melon and Chinese sausage, paired with Margerum Wine Co.’s 2017 Riviera Rosé and Victory Brewing Company’s Home Grown lager. CiUDAD’s seared cauliflower steak and chicken with basmati rice and pickled tomatoes will be accompanied by a 2013 Chehalem Corral Creek Vineyards 2013 pinot noir and Port City Brewing Company’s Port City Porter. For dessert, Border Grill’s pastel tres leche with passion fruit and prickly pear will be served with the 2013 Iron Horse Classic Vintage Brut along with The Bruery’s White Chocolate wheatwine-style ale. Tickets for the black-tie fundraising dinner were priced at $500, and this year funding will be directed toward the production of major upgrades to the museum’s exhibition, “FOOD: Transforming the American Table.” The evening is made possible with the generous support of The Julia Child Foundation for Gastronomy and the Culinary Arts; Clark Construction Group LLC; the Coretz Family Foundation; Al and Angela Diaz; Johanna Mendelson Forman, creator of Conflict Cuisine; Los Angeles LGBT Center; MGM National Harbor; Potomac Construction Services; Vincent Szwajkowski and Alexandra Nemerov; Wegmans; Warren and Barbara Winiarski, Winiarski Family Foundation; Bon Appétit Management Co.; John Deere; Loacker; and Dr. and Mrs. Enrique Segura. Major support for Smithsonian Food History Weekend is provided by The Julia Child Foundation for Gastronomy and the Culinary Arts, Wegmans and the Willard InterContinental in Washington, D.C. The Food History Weekend is a multifaceted event that is made up of four distinct experiences over three days featuring cooking demonstrations, conversations, activities and displays. This year’s theme, Regions Reimagined, will explore the history and changing dynamics of regional food culture in the U.S. and how ideas of region create community and inspire debate. Chefs, scholars, farmers, food entrepreneurs and writers will look at how regions have been redefined and reimagined through food. The complete schedule of events and participants is available at https://s.si.edu/FoodHistoryFestival2018. The Food History Roundtables, Friday, Nov. 2, offer moderated discussions that are free and open to the public. The four sessions feature chefs, historians, authors and researchers discussing region, foodways and the dynamics of change. More information, including the schedule and free registration, can be found at http://s.si.edu/FoodRoundtables. The Food History Festival, Saturday, Nov. 3, features free activities all day for visitors, including live cooking demonstrations, hands-on learning, guided tours, special talks, performances and rarely displayed objects from the museum’s collection. More information is available at http://s.si.edu/FoodHistFestival. Last Call: The Great History of American Brewing, Saturday, Nov. 3, rounds out the weekend with a ticketed evening program exploring the relationship between region and beer. Brewers, historians and other experts will lead the conversation followed by a chance to sample select craft beers from breweries around the country. Tickets for this event can be purchased at https://s.si.edu/LastCall. The Food History Weekend is part of the museum’s Smithsonian Food History Project, which in addition to the exhibition, includes free daytime programs year-round and “After Hours” evenings that mix history with themed food and drink. Learn more at http://s.si.edu/FoodHistory. Mary Sue Milliken and Susan Feniger are award-winning chefs, cookbook authors, TV personalities, entrepreneurs and pioneers of world cuisine. Thirty-five years ago they opened City Café and CITY Restaurant in Los Angeles, and are co-chefs and co-owners of Border Grill restaurants, trucks and catering in Los Angeles and Las Vegas. This year, they were named the recipients of the Los Angeles Times’ annual Gold Award. They have co-authored six cookbooks, starred in nearly 400 episodes of the Food Network’s Too Hot Tamales TV series and have competed in different seasons of Bravo’s Top Chef Masters, winning money for their selected charities. For more information, visit http://www.bordergrill.com/. The Julia Child Foundation for Gastronomy and the Culinary Arts was created by Julia in 1995 and became operational in 2004. Its mission is to honor and further Julia’s legacy, which centers on the importance of understanding where food comes from, what makes for good food and the value of cooking. Headquartered in Santa Barbara, California, the foundation is a non-profit that makes grants to support research in culinary history, scholarships for professional culinary training, food writing and media as well as professional development and food-literacy programs. 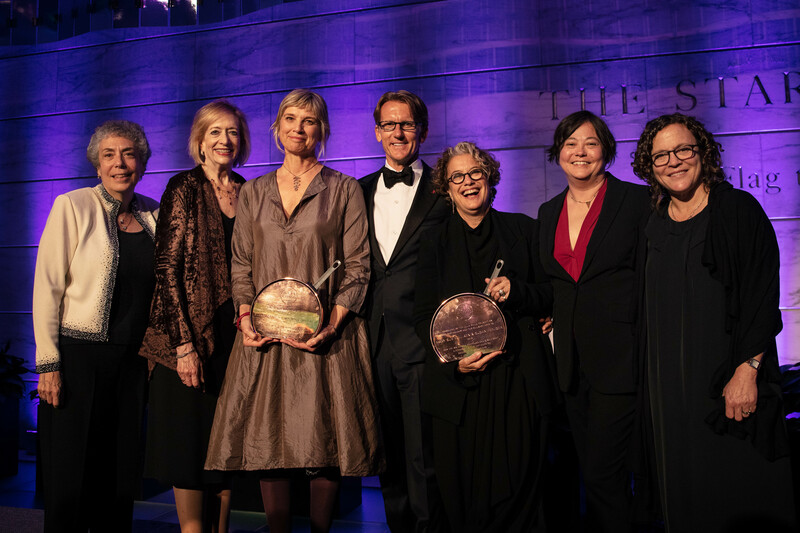 The Julia Child Award was presented to chefs Mary Sue Milliken and Susan Feniger at the annual 2018 Food History Gala at the National Museum of American History. From left, Sue Fruchter, Interim Director, National Museum of American History; Barbara Fairchild, food editor and writer; Mary Sue Milliken, award recipient; co-chef and owner of Border Grill; Eric W.